This past weekend, the annual An Evening with Champions show took place at Harvard University in Cambridge, Massachusetts. This was the 48th annual edition of the nonprofit charity show, organized and produced by Harvard students. An Evening with Champions was founded to benefit The Jimmy Fund, which supports pediatric and adult cancer research and treatment. 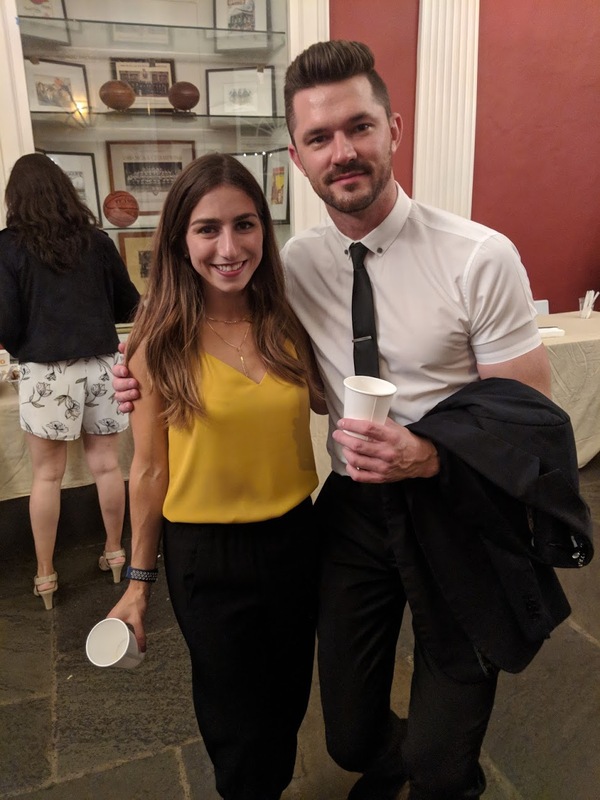 The show’s connection to its core mission felt more tangible than ever this year, with an uplifting performance from cancer survivor Molly Malone and an emotional tribute from Oleg Protopopov in memory of his wife Ludmila, who died last year from cancer. Sharita Taylor opened the show with a nice performance to “Brave” by Sara Bareilles. Tyler recently won a bronze medal in figure skating at the Special Olympics World Games; she is the first Special Olympics skater to perform at An Evening with Champions. She gave it her all in this program, and the lyrics and theme of the song (“I want to see you be brave”) were inspiring. Tiffany Lau skated next, performing an upbeat number featuring a great Ina Bauer. Lau has medaled several times at the Hong Kong championships and is now a student at Harvard. She was the co-chair of this year’s event. Kelvin Li put out an entertaining program to “This is Gospel” by Panic: At the Disco. Li had lots of speed and energy and landed a triple toe loop, double Axel, and triple Lutz. A former two-time competitor at U.S. Nationals, Li is now a student at Harvard and was the skater liaison for this year’s show. Next up were Team Excel Junior, a synchronized skating team from the Skating Club of Boston. They skated a fun, dance-y program to “Wings” by Little Mix. Selena Zhao followed with a beautiful program to “Fields of Gold” by Sting. Zhao didn’t perform any difficult jumps in the routine, but she showed good spins, interesting transitions, and nice, strong edges in her footwork. The program was lovely to watch–as was her sparkly blue ombre dress, a stunner. It turned out the dress was on loan from Angela Wang, who was also in the cast and is a good friend of Zhao’s. Former Canadian national junior champion Zhao is now a Harvard student. After the event, she said with a laugh that she had put her program together “in about an hour.” Regardless, the results were good. Kevin Shum then performed to “Luck Be A Lady” by Frank Sinatra. I really enjoyed this program from Kevin! It’s such fun music, and he skated it with lots of charm, speed, and energy. (Also, a great smile.) He landed a very nice double Axel (lots of height), a crisp triple Lutz, and triple flip. Kevin is a senior at MIT now, and said this was his fourth time performing in An Evening with Champions. He enjoys doing the show every year. Angela Wang skated her new short program to the popular song “Praying” by Kesha. Angela landed a triple toe loop (step out) and two double Axels. Her spins were excellent, very fast and well-centered. She skated with great speed and power throughout, looking very fit and prepared for her upcoming international events (Finlandia Trophy, NHK Trophy). 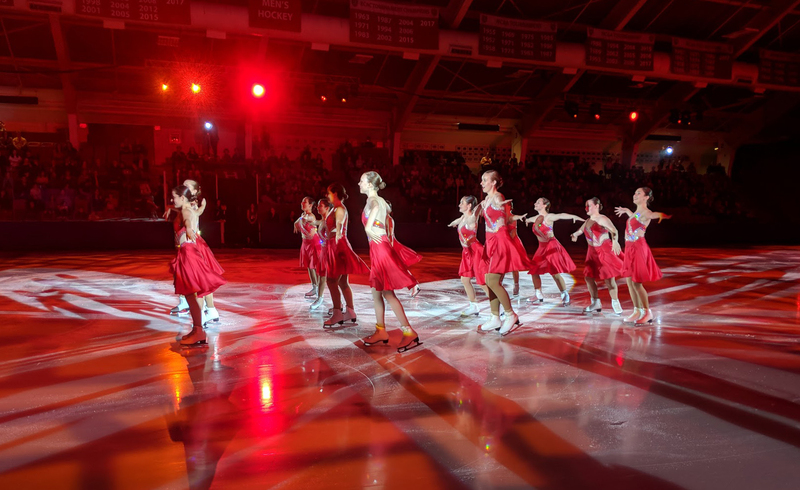 Choreographed by Karen Kwan, with assistance from Michelle Kwan, the program is lovely and earned a great reaction from the crowd at Harvard. Afterward at the post-show reception, Wang spoke about how much she enjoyed working with the Kwans on the program. 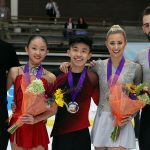 “I’m basically in skating because of Michelle Kwan, so to work with her and Karen was amazing,” said Wang. The program came together very quickly, in about a day, and Wang said she really enjoys training it in practice. Wang said that the Kwans were instrumental in her recent coaching change to Ravi Walia. After 7 years of training in Colorado Springs, she felt it was time for a change. There were no issues with her situation in Colorado. “But I felt if I didn’t try something different, I would regret it,” she said. When she reached out to the Kwans for advice, Michelle and Karen both recommended Walia as a potential new coach. She made the move to Edmonton, Canada, to work with him just a couple of weeks ago, and said everything is going well so far. Meanwhile, Wang continues to pursue her bachelor’s degree in exercise science, taking one online course this semester. 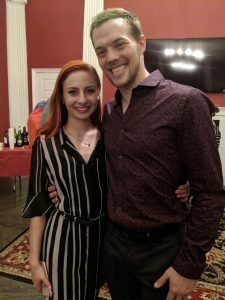 Tarah Kayne/Danny O’Shea skated after Wang and debuted their new short program to “That’s It (I’m Crazy)” by Sofi Tukker. Kayne/O’Shea had fun with this club music-style program, playing to the crowd and showing off some big tricks. They performed a double twist, side-by-side double Salchows (fall), a throw triple Salchow (hand down), and a good hand-to-hand lift with a dramatic flip out exit. Tarah wore a stylish silver halter top and black pants, perfect for the routine. This program is a departure stylistically for Kayne/O’Shea. They said afterward that choreographer Shae-Lynn Bourne recommended the song, and both of them immediately liked it. They did hesitate a bit because it was so different from their past programs, but decided to trust Bourne’s judgment and go for it. They’re pleased with the finished program and said it’s fun to skate to, although they’re still developing it and working to refine their unison and delivery. Kayne said that her knee, injured last spring, is now much better after several months of rehabilitation at the Olympic Training Center in Colorado Springs. The couple have worked closely with physiotherapists and other experts to create a “very scientific” and detailed training plan to avoid further injury, said O’Shea. The only downside to the couple’s move to Colorado Springs? Their beloved dog, Snow, has not yet been able to join them. While they’re living at the Olympic Training Center, Snow is temporarily staying with Danny’s parents in Chicago (where he enjoys playing with an older family dog). Encore Boston, a children’s theatre on ice team from Skating Club of Boston, closed the first act of the show with a high-energy, well-rehearsed number based on Maurice Sendak’s Where the Wild Things Are. The second act opened with a video tribute to Olympic champion Ludmila Belousova. With her husband Oleg Protopopov, Belousova was a member of the cast of An Evening with Champions for many years. The two-time Olympic champions journeyed from their home in Grindelwald, Switzerland each fall to appear in the show, and were much loved by audiences. Oleg Protopopov skated a beautiful tribute program, which he said was intended not just for his late wife, but for all women. It’s amazing how much grace and emotion he still brings to the ice, at 86 years of age. Watching him was proof that the desire and ability to tell a story on the ice don’t go away, even with age or reduced technical ability. His program was haunting and lovely. Repeatedly, he reached out for the longtime partner who is now gone, and reached upward, as if thinking of her above. He ended with a fluttering of his arms, perhaps evoking the spirit that has flown away. Melanie Lambert/Fred Palascak followed with a well-skated program to “I Could Have Danced All Night,” including a nicely done lift and crowd-pleasing headbanger move. Former U.S. Nationals competitors and now pairs coaches at the Skating Club of Boston, Palascak/Lambert used to take lessons with the Protopopovs during the summers at Lake Placid. So their program felt like a tribute to Ludmila as well. The theme of “passing the torch” from one generation of pairs skaters to the next continued as young pair Cate Fleming/Jedidiah Isbell, students of Lambert/Palascak, took the ice. Fleming/Isbell skated their enjoyable “Singin’ in the Rain” short program. They completed a nice hand-to-hand lift with good ice coverage, a double twist, a throw double Salchow, and side-by-side double Axels (hand down from Isbell). Afterward, Isbell said their focus this season is improving the quality of their current pairs elements. The duo are 13 and 16 years old, respectively. Next, Elladj Baldé got the crowd going with his saucy “Uptown Funk” program. He landed a big triple toe, a triple Salchow, and a back flip. There was a fair amount of posing/dancing in place in this program; but once he started moving across the ice, it was a lot of fun. Baldé also delighted the crowd by doing 3 back flips in a row as an encore! A former medalist at Canadian Nationals, Baldé is now retired and has a new company called Skate Global, the aim of which is to perform and bring the magic of skating all over the world. Alexander Johnson debuted his new short program to “Don’t Stop the Music” by Jamie Cullum. He landed double Axel, a nice triple Lutz, and triple flip (two-foot/turnout). The program ended with a dramatic sliding stop that went directly into a spin–very cool. This dance/hip hop routine is a different kind of program than we’ve seen from Johnson before, but he skated it very well. He looks well-prepared for his international season (Finlandia, NHK). 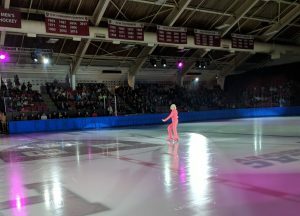 Kailani Crane of Australia put out a fun, uptempo program to a remix of Britney Spears’ “Toxic.” She landed a double Axel and triple loop (slight 2-foot). Crane showed lots of attitude and sass and had a great costume–a multicolor, gold-trimmed coat over sparkly black shorts and bustier top. Next up were The Haydenettes, reigning U.S. national synchronized skating champions, skating to a haunting Woodkid medley. It’s always so great seeing this team live! They were very smooth, fast, well-trained, and coordinated. 2006 World champion Kimmie Meissner skated a lovely routine to “Halo” by Beyonce, wearing a long-sleeved, flowing white dress. Meissner landed double Axel and did a beautiful spiral in this lyrical program, which showed off her musicality. 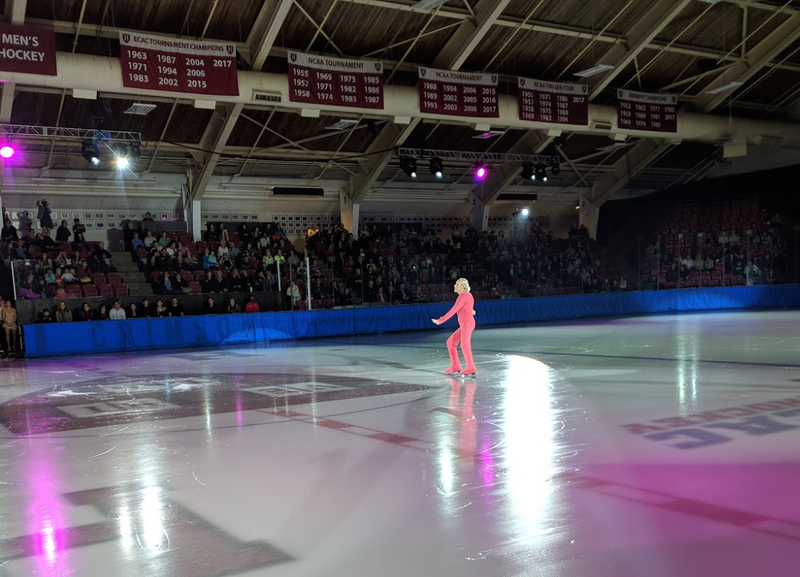 Local Boston-area skater and cancer survivor Molly Malone then skated an emotionally resonant program to “River” by Bishop Briggs. Molly was a teenager when she was diagnosed with a rare form of bone cancer 2 years ago. After successful treatment, she is now cancer-free and able to skate again. It was great to see her on the ice. Ross Miner, reigning U.S. silver medalist, put out a good performance of his “Downtown” short program from last season. Miner landed a great triple Salchow, double Axel, and single Lutz, while also showing his trademark fast, impressive spins and great speed on the ice. Miner said that he recently bought a house, which is keeping him busy. 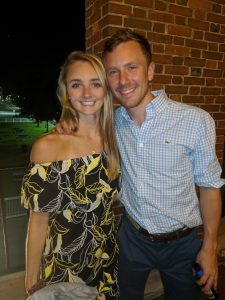 He’s also coaching at two rinks in the Boston area and taking several college courses online and at Harvard Extension School. Miner’s girlfriend Heidi Munger, a former U.S. Nationals competitor, attended the show as well. Munger is also very busy this fall, as she is continuing to compete while pursuing pre-med. studies at Boston University. In addition, she competed in collegiate skating last season! 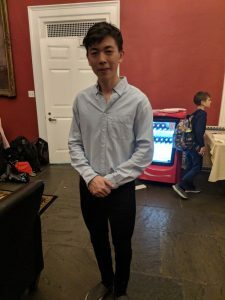 Zhou did impressive double duty this weekend, first competing at U.S. International Classic on Thursday and Friday, then taking a 2:30 a.m. flight out of Salt Lake City to make it to Boston for An Evening with Champions. After the event, Zhou admitted to not getting much sleep but said it was worth it, and he was happy to perform in the show. Although his performances in Salt Lake weren’t perfect, Zhou said he has received good feedback on his programs so far from “the people that matter,” as he put it. He noted that the two programs are quite different, requiring different styles of movement. He enjoys the modern, flowing style of the “Exogenesis” routine. Zhou feels the short program is further along in its development than the long program. He was able to visit Lori Nichol, choreographer of the short program, twice during the off-season, but has not yet been able to fit in a second visit with Jeff Buttle, choreographer of his free skate. Two-time U.S. pairs champion Marissa Castelli was also at the show; she choreographed the opening and closing numbers. Following the end of her partnership with Mervin Tran, Castelli says she is very happy to be home again in Rhode Island. “I loved Montreal, but I’d been wanting to come home for a while.” She is busy coaching and will also be the head choreographer for the Skating Club of Boston’s Ice Chips show next spring. Castelli hasn’t ruled out a return to competitive skating, but she’s happy with where she is at the moment. In her free time, she’s training for and running half-marathons, which she enjoys. She also got a dog! It’s always a great experience to go to An Evening with Champions. Not only for the skating, but also because all the skaters and organizers always seem truly happy to work on this show, and dedicated to the cause it supports.